Naomi Uemura(植村 直己,Uemura Naomi, February 12, 1941 – c. February 13, 1984) was a Japanese adventurer. He was particularly well known for doing alone what had previously been achieved only with large teams. For example, he was the first man to reach the North Pole solo, the first man to raft the Amazon solo, and the first man to climb Denali solo. He disappeared while attempting to climb Denali in the winter. Uemura was born in Hidaka, now part of Toyooka, Hyōgo, Japan. Shy, he began climbing in college in the hope that mountaineering would increase his self-confidence. Hidaka was a town located in Kinosaki District, Hyōgo Prefecture, Japan. Toyooka is a city in the northern part of Hyōgo Prefecture, Japan. The city was founded on April 1, 1950. Before his 30th birthday, Uemura had solo-climbed Mount Kilimanjaro, Aconcagua, Mont Blanc, and the Matterhorn, had walked the length of Japan, and summited during the first (1970) Japanese expedition to climb Mount Everest and subsequent disastrous 1971 International Everest Expedition. 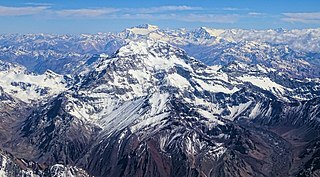 Aconcagua, with a summit elevation of 6,960.8 metres (22,837 ft), is the highest mountain in both the Southern and Western Hemispheres. 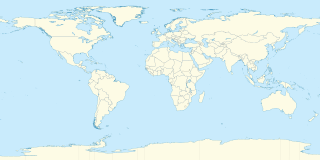 It is located in the Andes mountain range, in the Mendoza Province, Argentina, and lies 112 km (70 mi) northwest of its capital, the city of Mendoza, about five km (3.1 mi) from San Juan Province and 15 km (9.3 mi) from the international border with Chile. The mountain itself lies entirely within Argentina, immediately east of Argentina's border with Chile. Its nearest higher neighbor is Tirich Mir in the Hindu Kush, 16,520 kilometres (10,270 mi) away. It is one of the Seven Summits. 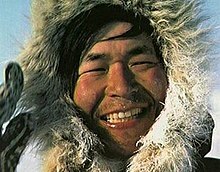 Uemura wrote that he almost gave up twice during his 1978 North Pole trip. On the fourth day of his trek, a polar bear invaded his camp, ate his supplies, and poked his nose against the sleeping bag where Uemura lay tense and motionless. When the bear returned the next day, Uemura was ready and shot him dead. On the 35th day of the trip, Uemura had hunkered down on an ice floe with his malamutes, when there was the roar of breaking ice and the floe cracked into pieces. He and his dogs were stranded on a tossing island of ice. After a night of terror, Uemura found a 3-foot-wide (0.91 m) ice bridge and raced to safety. The Alaskan Malamute is a large breed of domestic dog originally bred for their strength and endurance to haul heavy freight, and later as a sled dog. 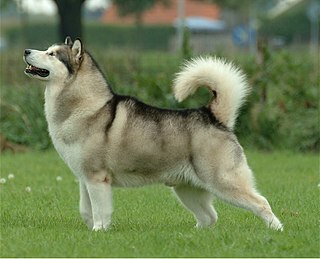 They are similar to other arctic breeds and spitz breeds, such as the Greenland Dog, Canadian Eskimo Dog, the Siberian Husky, and the Samoyed. He persevered and became the first ever to reach the Pole solo. Describing his 57-day push, he wrote, "What drove me to continue then was the thought of countless people who had helped and supported me, and the knowledge that I could never face them if I gave up." In this trip he cooperated with the Canadian Air Force and received his supplies from its helicopters. After the trip he questioned such extensive support and decided to carry supplies on his own back. In August 1970, Uemura climbed Denali (then known as Mt McKinley) solo, becoming the first person to reach the top alone. He did this quickly and with a light pack (8 days up, versus an average of 14 days or so; 55-pound (25 kg) pack, versus an average probably twice that). August is after the end of the normal climbing season. While the weather he faced was not terrible, the mountain was almost empty with only four other people on it. Though many people have climbed Denali alone since Uemura, most do it in the middle of the climbing season. Uemura then prepared to climb Denali again solo in winter; however, for people unfamiliar with Alaskan climbing, the difficulty of a winter ascent can often be misjudged. Nobody had successfully climbed any large Alaskan peak in winter until 1967, when Gregg Blomberg organized an expedition that got to the top of Denali (Blomberg himself did not summit). This team lost one member and nearly lost the remaining members in a storm on the way down. Team member Art Davidson's book, Minus 148, recounts the events of the climb and was named after the storm that jeopardized the team. There is a high degree of danger with glacier travel, and even short treks across the ice are considered hazardous. For example, glaciers are often broken with cracks, called crevasses, that are often covered with snow and not visible. Due to these occurrences as well as other underlying factors, an ascent is both very difficult and very dangerous to attempt without a team. Uemura had developed a "self-rescue" device which consisted of bamboo poles tied over his shoulders. The poles would span any crevasse into which he fell and allow him to pull himself out. He planned a very light run, with only a 40-pound (18 kg) pack plus sled. He kept his gear light by planning to sleep in snow caves and therefore freeing himself from needing to carry a tent. He also skimped on fuel and planned to eat cold food. On February 13, 1984, one day after his 43rd birthday, Uemura spoke by radio with Japanese photographers who were flying over Denali, saying that he had made the top and descended back to 18,000 feet (5,500 m). He planned to reach base camp in another two days but never made it. There appeared to be high winds near the top, and the temperature was around −50 °F (−46 °C). Planes flew over the mountain but did not see him that day. He was spotted around 16,600 feet (5,100 m) the next day (presumably on the ridge just above the headwall). However, complications with weather made further searching difficult. It was likely that Uemura was running out of fuel at this point, but because of his reputation nobody wanted to send a rescue party for fear it would offend him. Doug Geeting, one of the bush pilots who had been "Uemura spotting" over the previous week, said "If it were anybody else, we'd have somebody [a rescuer] on the mountain already". On February 20, the weather had cleared, and Uemura was nowhere to be found. There was no sign of his earlier camp at 16,600 feet (5,100 m) and no evidence that caches left by other climbers nearby had been disturbed. Two experienced climbers were dropped at 14,000 feet (4,300 m) to begin a search. Though another storm came in, they stayed on the mountain until February 26, finding a cave in which Uemura had stayed at 14,000 feet (4,300 m) on the way up, but no sign of Uemera himself. A diary found in the cave revealed that Uemura had left gear there to lighten his load on the summit push. He had also left his self-rescue poles back at 9,500 feet (2,900 m), knowing he was past the worst crevasse fields. Most people figured he had fallen on his descent of the headwall and been hurt, died, and was buried by snow. Another theory is that he could have made it to 14,200 feet (4,300 m) (which is the base of the headwall) and then fallen into one of the many crevasses there and perished. A group of Japanese climbers arrived to look for the body. 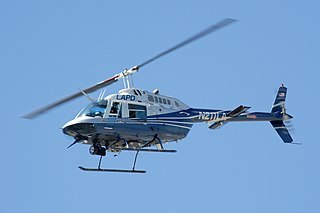 They failed, though they did locate much of his gear at 17,200 feet (5,200 m). The diary found in the 14,000 feet (4,300 m) cave has been published in Japanese and English. It describes the conditions that Uemura suffered—the crevasse falls, -40° weather, frozen meat, and inadequate shelter. The diary entries showed him to be in good spirits and documented the songs he sang to stay focused on his task. The last entry read, "I wish I could sleep in a warm sleeping bag. No matter what happens I am going to climb McKinley." He is remembered not only as a gifted climber and a driven adventurer, but also as a gentle, self-effacing man who cared about others. In the words of Jonathan Waterman, "[Just as remarkable] as his solo achievements was his sincere modesty and unassuming nature. Another part of his greatness lay in his deep interest in everyone he met." ↑ Hoeman, J Vincent (1969). H. Adams Carter, ed. "Climbs and Expeditions". American Alpine Journal. Philadelphia, PA, US: American Alpine Club. 16 (43): 379. 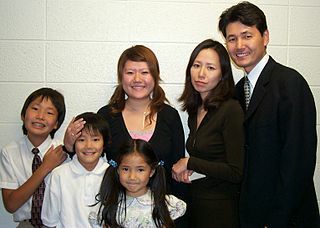 Wikimedia Commons has media related to Naomi Uemura . Jim Wickwire is the first American to summit K2, the second highest mountain in the world. Wickwire is also known for surviving an overnight solo bivouac on K2 at an elevation above 27,000 ft or 8,200 m; considered "one of the most notorious bivouacs in mountaineering history". Anatoli Nikolaevich Boukreev was a Russian Kazakhstani mountaineer who made ascents of 10 of the 14 eight-thousander peaks—those above 8,000 m (26,247 ft)—without supplemental oxygen. From 1989 through 1997, he made 18 successful ascents of peaks above 8000 m.
Scott Eugene Fischer was an American mountaineer and mountain guide. He was renowned for his ascents of the world's highest mountains made without the use of supplemental oxygen. Fischer and Wally Berg were the first Americans to summit Lhotse, the world's fourth highest peak. Fischer and Ed Viesturs were the first Americans to summit K2 without supplemental oxygen. Fischer first climbed Mount Everest in 1994 and later died during the 1996 blizzard on Everest while descending from the peak. Changtse is a mountain situated between the Main Rongbuk and East Rongbuk Glaciers in Tibet, China, immediately north of Mount Everest. 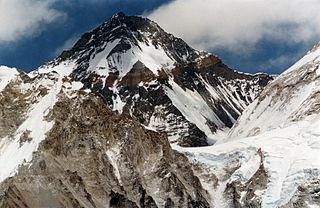 It is connected to Mount Everest via the North Col.
Marty Hoey was a mountaineer who took part in a 1982 expedition to Mount Everest. During an attempted ascent that would have made her the first American woman to summit Everest, she plunged over the edge of the Great Couloir to her death, as the result of an unsecured climbing harness. The Man Who Skied Down Everest is a documentary about Yuichiro Miura, a Japanese alpinist who skied down Mount Everest in 1970. The film was produced by Canadian film maker F. R. "Budge" Crawley. Miura skied 2,000 m (6,600 ft) in two minutes and 20 seconds and fell 400 m (1,320 ft) down the steep Lhotse face from the Yellow Band just below the South Col. He used a large parachute to slow his descent. He came to a full stop just 76 m (250 ft) from the edge of a bergschrund, a large, deep crevasse where the ice shears away from the stagnant ice on the rock face and begins to move downwards as a glacier. David Sharp was an English mountaineer who died near the summit of Mount Everest. His death caused controversy and debate, because he was passed by a number of other climbers heading to and returning from the summit as he was dying, although a number of others did try to help him. Ray Genet, often referred to by the nickname Pirate, was a Swiss-born American mountaineer. He was the first guide on North America's highest mountain, Alaska's Denali . Genet is the grandfather of actress Q'Orianka Kilcher. Jimmy Chin is an American professional climber, mountaineer, skier, photographer, and Academy Award-winning film director. Green Boots is the name given to the unidentified corpse of a climber that became a landmark on the main Northeast ridge route of Mount Everest. Though his identity has not been officially confirmed, he is believed to be Tsewang Paljor, an Indian climber who died on Mount Everest in 1996. The term Green Boots originated from the green Koflach mountaineering boots that are on the feet of the corpse. All expeditions from the north side encountered the body curled in the limestone alcove cave at 8,500 m (27,900 ft). In 2006, a different climber, David Sharp, died during a solo climb in what is known as "Green Boots' Cave". David Allen Hahn is an American professional mountain guide, ski patroller, journalist and lecturer. In May 2013, he reached the summit of Mount Everest for the 15th time - the most for a non-Sherpa climber, according to Outside Magazine contributor and climber Alan Arnette. Among Hahn’s other notable accomplishments are his 35 summits of Vinson Massif, Antarctica’s highest mountain. 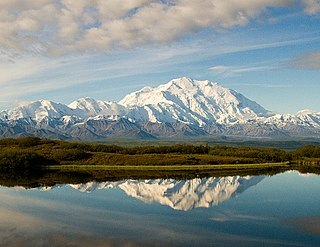 He has reached the summit of Denali in Alaska, North America’s highest peak, 21 times over the course of 30 expeditions. Indonesia Seven Summits Expedition is a team from Indonesia that reached all the Seven Summits before Proclamation of Indonesian Independence date celebration on August 17, 2011. The other incomplete team with different coordination reached it before August 17, 2012 and the second attempt in May 2013 made the team complete. Now, Indonesia has 8 Seven Summiters. Martin Walter Schmidt, known as Marty, was a New Zealand-American mountain climber, guide and adventurer. Vernon "Vern" Tejas is an American mountain climber and mountain guide. He is the current world record holder in the amount of time taken to summit all of the Seven Summits consecutively, having also previously held the same record. He was also the first person to solo summit several of the world's tallest peaks. Tejas was named one of the top fifty Alaskan athletes of the twentieth century by Sports Illustrated in 2002. In 2012, he was elected to the Alaska Sports Hall of Fame. Tejas plays the harmonica and guitar. He currently resides in Greenwich Village, New York.